For larger accounts in a newspaper medium we try several strategies to gain audience. A noticeable device is the Spadea or Gatefold. 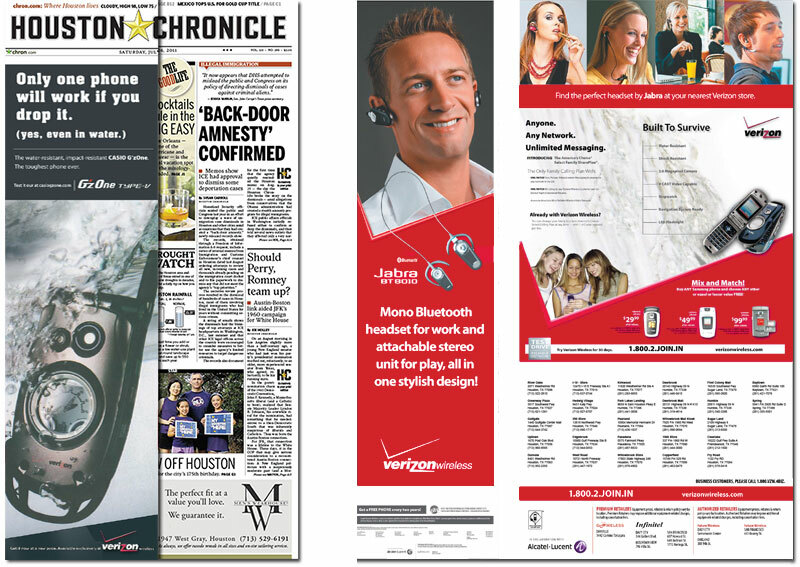 For Verizon Wireless a spadea was presented along with a double-truck spread and a “goalpost” shaped ad. Together with other strategies such as spreads, shaped ads, sponsorships – we even created a 3D ad with glasses – ads that dominates the page are useful to larger accounts that can afford such placements. Spadeas fold over the cover and have an interesting 3D effect as the flag of the publication is printed at the top of both pages. Note that this doubletruck “points” from the dominant right page back to the left. This design device helps the eye travel across the mise-en-page. 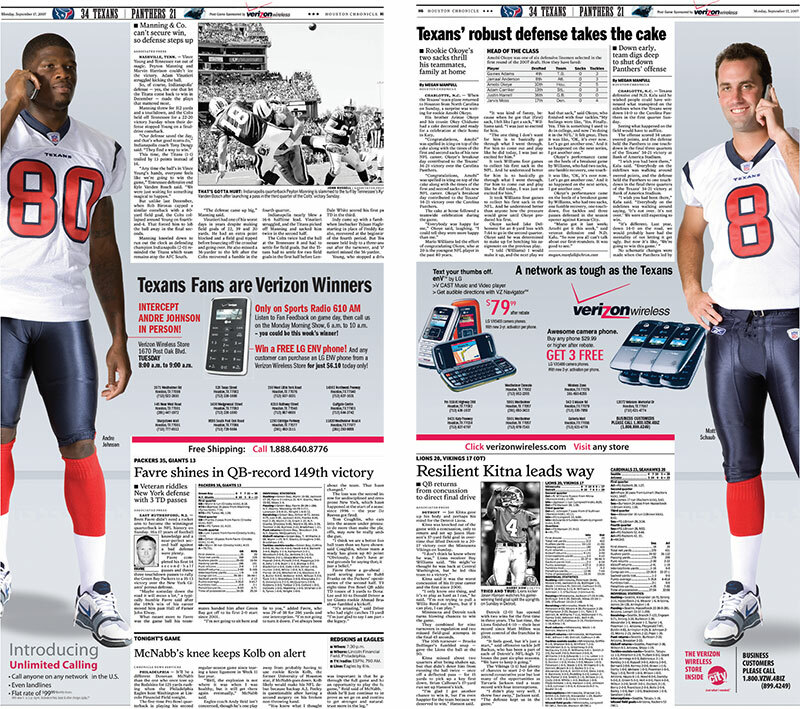 Example of the “Goal-post” shaped ad. 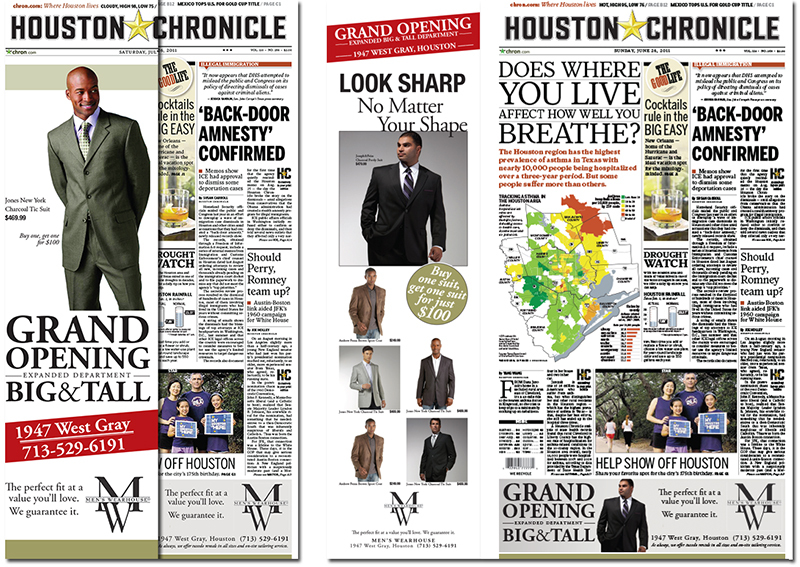 To see more shaped ads and adjacencies, visit the GRAPHIC DESIGN page by clicking here. 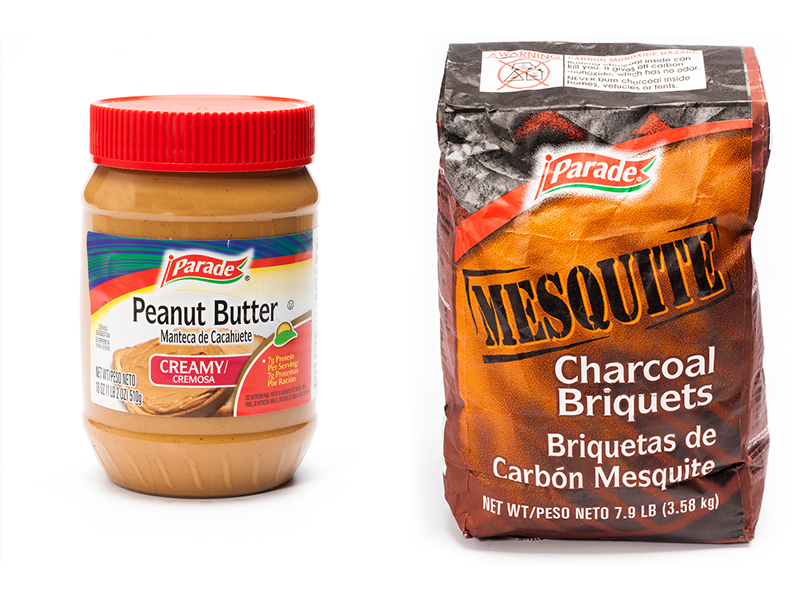 The key to product photography is plenty of light to fully illuminate the inventory. As a photographer the best approach is a straightforward display of the item. Whether the item is hardware, electronics, fashion or food, it’s important to clearly display and capture the detail of the item. This is especially true as e-commerce becomes the preferred method of shopping. Web banners are finally giving way to immersive designs that take advantage of mobile devices. Responsive web design (like this site) and creative navigations (unlike this site) have given rich media a more intuitive experience. Often, a client will want a web banner ad along with a print ad. And often, per corporate procedure, each department will be assigned to each medium. However, this shouldn’t stop a print designer from quickly creating a web banner as well. The designer should always be mindful that each medium has its own strengths and to design accordingly. The banner ad shown above is designed to prompt interaction on Yahoo! 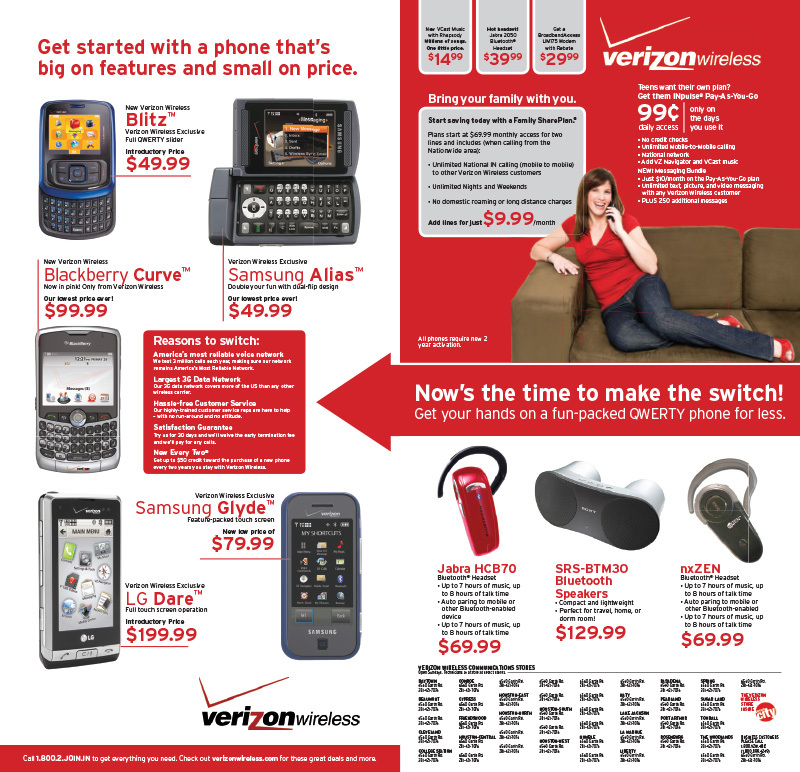 HotJobs – note that this is different design but has the same branding as the print ad shown below. Recruitment ads are usually packed with text tend to include overbearing logos, photos and job descriptions. 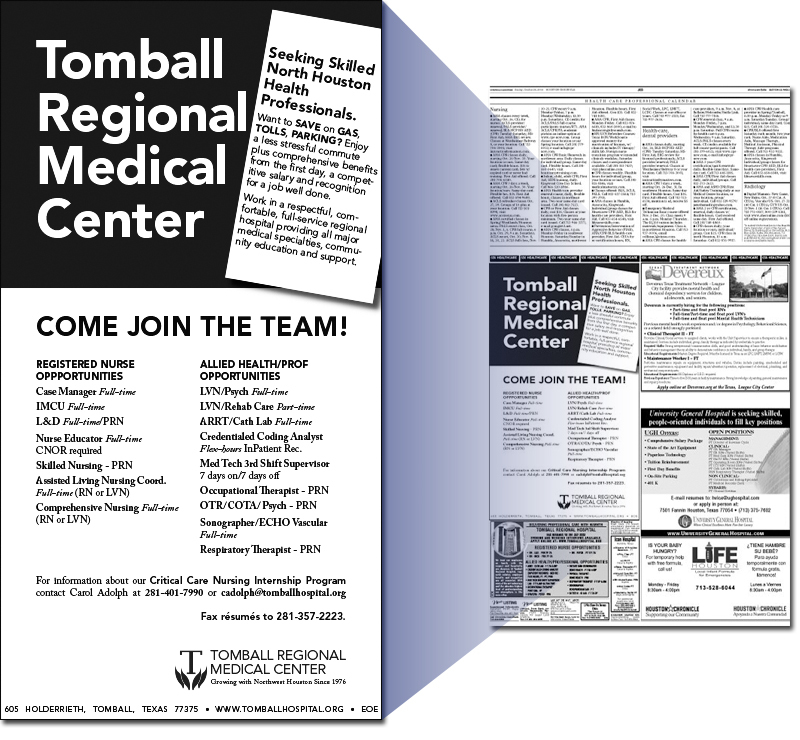 By using a bold reverse, editing out extraneous text, and breaking the border the ad is now easily noticed and read. 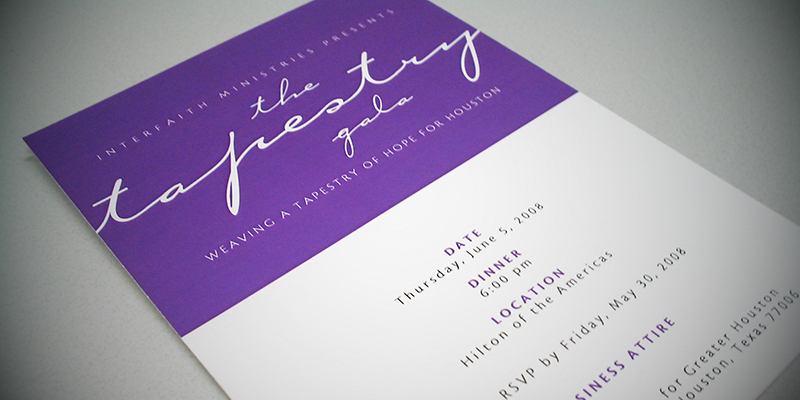 Interfaith Ministries was happy to learn that our team could create, print and distribute their newsletter, their annual report, and that our newsprint ads would help promote their cause (Meals on Wheels) and that we would coordinate their fundraising gala. As a creative lead on this yearlong project we put together four quarterly newsletters, a contingent of newsprint ads, several themes for their gala, along with all the associated mailings, invites, and donation cards. Below are several examples of the invitations that were created. The theme was interconnectivity. This mockup featured a basket-weave background and contains two simple die-cuts that were inter-folded providing a simple, cheap, and eye-catching feature. 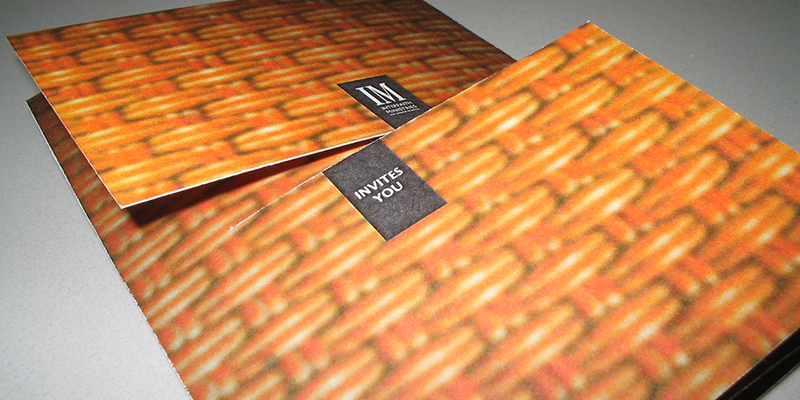 The invitation below is the same 3.5×5 inch standard with a “barn-door fold” instead of the inter-fold above. This one features a richer background that better matched the event’s location. A further simplification led to this 3.5×5 inch card – without folds. 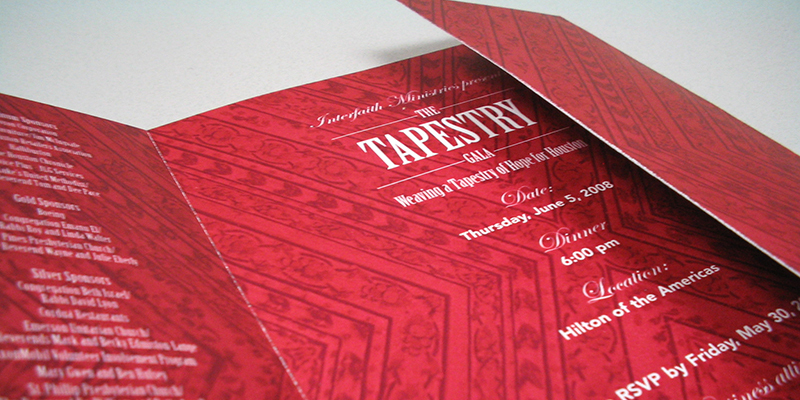 The invitation below was re-formatted 4×9.25 inches to fit into a #10 business envelope. This was done to accommodate sending the invite, its RSVP, the annual report, and the donation card all in one bulk mailing. To see more about this project, see the BRANDING page by clicking here. The weather page from data service Wunderground was rearranged to accommodate a sponsor for a one-year contract. Ruud advertising was allotted a 5 column x 10 inch ad along with a 1×1 “Ruud Tip” and a 1×2 “Ruud Fact” and a “Sponsored by Ruud” folio. This layout initiated a quarter-million dollar run in advertising. Note that the sponsored advertising is meant to flow within the weather data as the reader scans the page. Click here to see my page concerning ADJACENCIES. 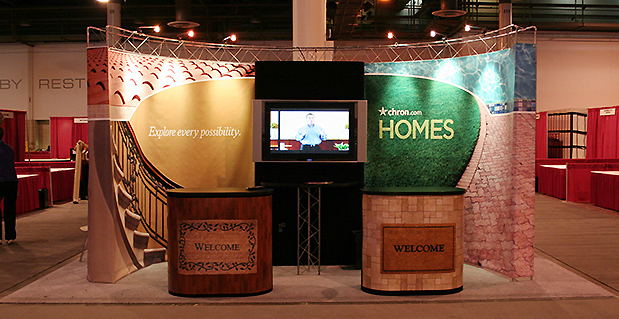 Above is the Houston Chronicle booth showcasing the new real estate services. Below is the 5-part video that ran in 9 minute loops explaining the various services. This video was the first in several HD video projects that were commissioned by the marketing department that were given away on 2GB flash drives, shown on-site, and on YouTube. 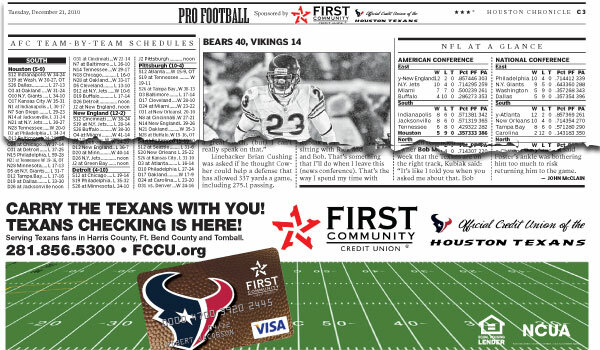 First Community Credit Union is a sponsor of the Houston Texans and to help promote we created a sponsorship page for them in the newspaper’s sports section. 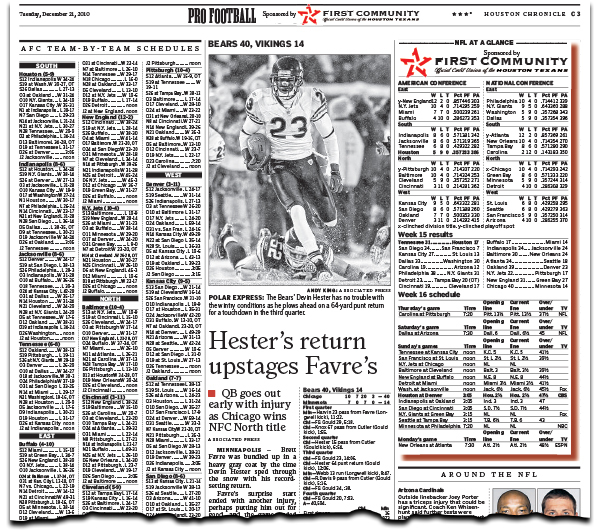 The adshape below features a grayscale “fade” in the background which was cleared by both the editorial department and the print presses for capability. This feature opens a new set of adshape possibilities. 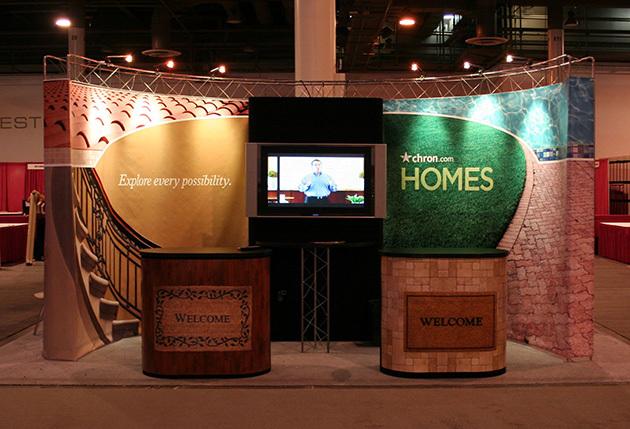 To see more about sponsorships and adjacencies, visit the GRAPHIC DESIGN page by clicking here. 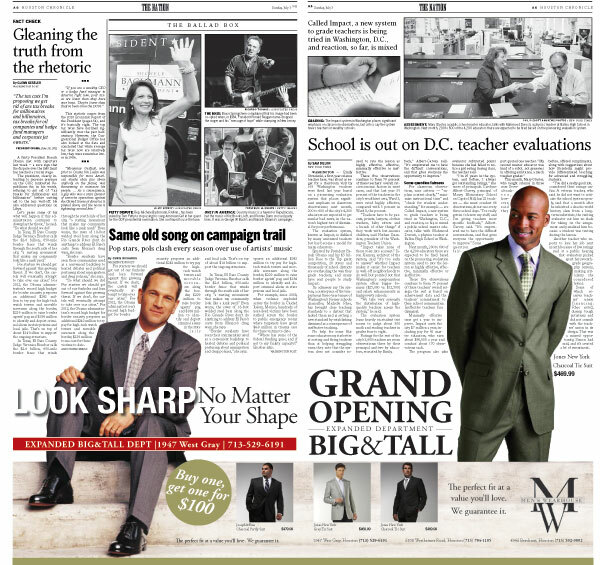 A doubletruck is when an ad spans the entire spread of two pages. this example can easily be converted in to a mock doubletruck as no content is in the gutter. This example for Men’s Wearhouse is an irregular adshape doubletruck that spans across a spread. A spadea was also created. 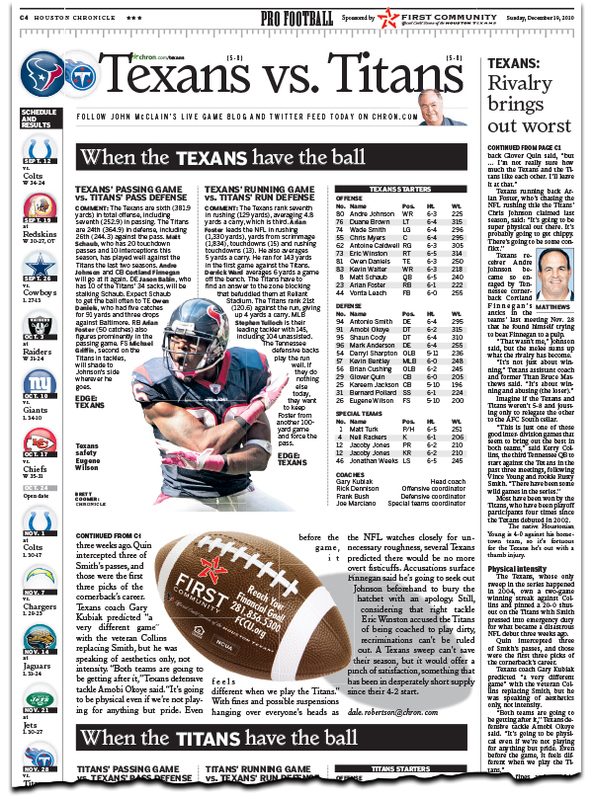 The front page also benefits with a strip ad at the bottom. 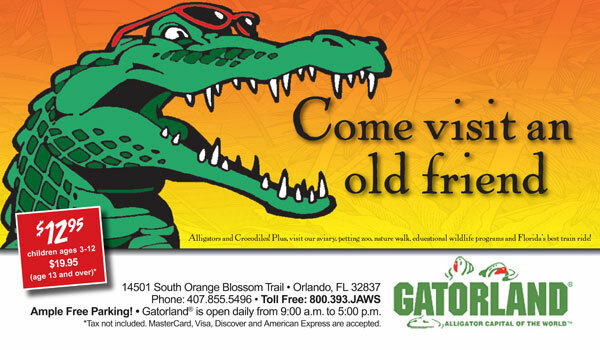 Gatorland family theme park showcasing thousands of alligators and crocodiles. The provided line illustrations were extensively used in the ads. Smart use of color and matching clip art for the background added texture.